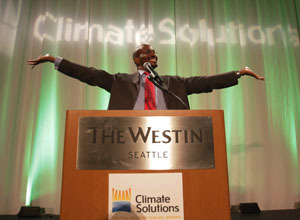 Climate Solutions holds three signature fundraisers through the year: an Annual Reception in Olympia and the Annual Breakfast in Seattle in the Spring, and our Annual Dinner in Portland in the Fall. Keynote speakers at past breakfast and dinner events have included author and environmentalist Bill McKibben, green jobs visionary Van Jones, urban revitalization strategy consultant Majora Carter, philanthropist Bill Gates on how to address climate change through clean energy innovation, EPA Administrator Lisa Jackson, business innovator Tom Steyer, Managing Director of the California Clean Energy Fund (CalCEF) Danny Kennedy, the creators of Showtime's Years of Living Dangerously, Nike's VP of the Innovation Accelerator Hannah Jones, and Mindy Lubber of Ceres. These events create inspiring forums for climate and clean technology leaders, provide opportunities for us to unveil new projects, and help us raise critical funds for our work. See below for upcoming signature events, or click here for our past events.